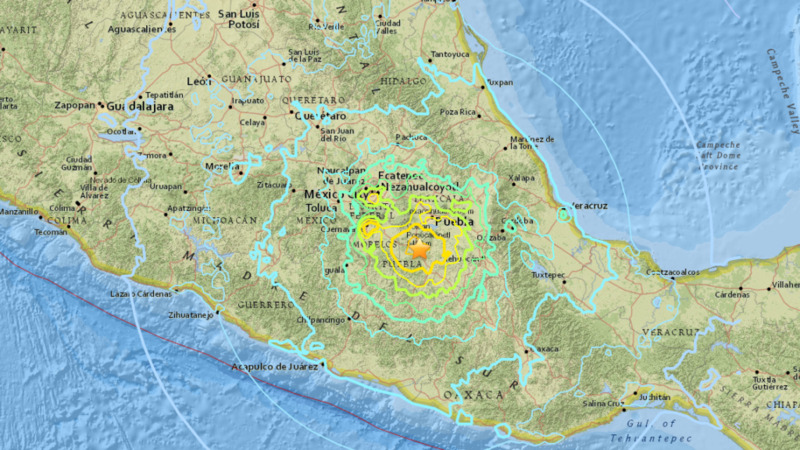 A 7.1 earthquake with its epicentre in Rabosa, Puebla, hit the country on Tuesday Dept. 19th at 13:14 local time. Due to its proximity to Mexico City, it was felt in most of the city and the damages are significant, also in the nearby States of Puebla and Morelos, and to a lesser extension in the State of Oaxaca who had already been affected by a 8.2 earthquake on September 8th. Most of the staff was present in our National office as it was during working hours. We had a simulation exercise at 11:00 am to commemorate the 1985 big earthquake so fortunately people had very fresh information about the security areas within the office and the evacuation protocol. As the epicentre was located in Puebla, the early warning system didn’t activate in a preventative manner but the city alarms started ringing as soon as the first movements were perceived. The staff waited in their security area until the movement stopped and then evacuated the building. We took shelter in a nearby park which is the safest area around our office. After a while two members of staff were allowed to enter the building to gather all of the staff’s bags and purses and everybody was sent home until further notification. Our building shows some cracks, in the stairs between ground and first floor, and in our floor, in one of the side walls. The building administrator reviewed the load-bearing walls and columns and said he didn’t notice anything alarming, but an official civil protection inspector is expected to visit the building to dictate whether it is safe to use. So until we are informed of the outcomes of this visit, we are maintaining all staff members at home, to avoid risks, and also because the transportation system has been affected and the streets must be left primarily to the ambulances, army and rescuers’ access. In Mexico City the most affected neighbourhoods are the ones in the center and south-center of the city. Until now, 40 buildings collapsed and many more are at risk according to Mexico City’s mayor, Miguel Angel Mancera, and 24 are about to collapse in the central area of the city. Rescuers are still working to save people trapped in the debris. The Ministry of Public Education (SEP) decreed that all schools in Mexico City, Puebla, Morelos, Oaxaca, Chiapas, Guerrero, Tlaxcala, Mexico, Hidalgo and Michoacán should be suspended from classes today. Likewise, the institution reported that in Mexico City, 209 affected schools are counted, in a preliminary way, 15 with major damages. We will provide you with further updates from Mexico as they arise.